Ancor Proprietary premium vinyl insulation stays flexible even in extreme cold and resists salt water, battery acid , Oil, gasoline and ultra-violet radiation exclusive insulation is rated at 600 volts, 105°C C dry and 75°C wet and resistant to heat and abrasion . 16GA Black, Green, Red, Blue. 14GA Black, Red, Yellow, Green, Blue. 12GA Black, Red, Yellow, Green, Blue. 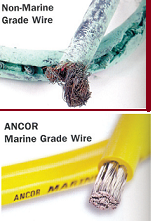 Ancor Marine Grade wire is manufactures from tinned copper stranding for maximum protection against corrosion and electrolysis. 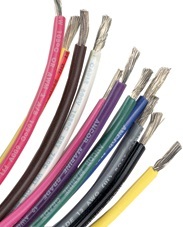 Ultra flexible (Type 3) Stranding resists fatigue due to vibration and flexing. 2GA Black , Red . 1GA Black , Red . 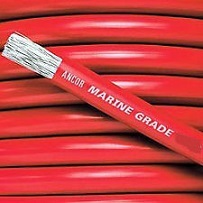 Ancor Duplex, Triplex and Multi-Conductor cables are made to surpass the highest UL Boat Cable Standards with ultra flexible (type3 / class K) stranding to resist due to vibration and flexing. Features three Marine Grade primary conductors (white, black, and green) in a white common jacket. Super Flexible, easy to run. Clear jacket to blend into the environment. Drawn copper, unidirectional lay for ultimate in sound quality. Tinned copper for corrosion resistance in the marine environment. Size 2 GA, 4 GA, 6 GA.